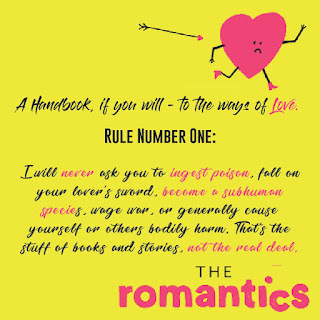 Blurb Description: Perfect for fans of Lauren Myracle and Rainbow Rowell, The Romantics will charm readers of all ages. Gael Brennan is about to have his heart broken when his first big relationship crumbles on the heels of his parents’ painful separation. Love intervenes with the intention of setting things right—but she doesn’t anticipate the intrusion of her dreaded nemesis: the Rebound. Love’s plans for Gael are sidetracked by Cara, Gael’s hot sauce–wielding “dream girl.” And the more Love meddles, the further Gael drifts from the one girl who can help him mend his heart. Soon, Love starts breaking all her own rules—and in order to set Gael’s fate back on course, she has to make some tough decisions about what it means to truly care. And by ADORABLE I mean that it had me laughing at the funny moments (there was a scavenger hunt in a zoo), cringing at the awkward parts as we all tend to do in a romantic comedy and going “aww” (a word I almost NEVER use) when everything was cute and fluffy. The one liner on the cover sold me on reading this book – ‘A rom-com about love. Told by Love’ – and I loved every second of it. One of my favourite parts about this book was that it was ACTUALLY told from Love’s perspective, but we got to saw Gael’s thoughts with commentary from Love on what he was thinking. It was ADORABLE, with all these sidenotes about the different types of people who fall in love including Dreamers, Loyalists, Serial Monogamists, Romantics and Cynics, and it was such fun to read that I honestly didn’t want the book to end. 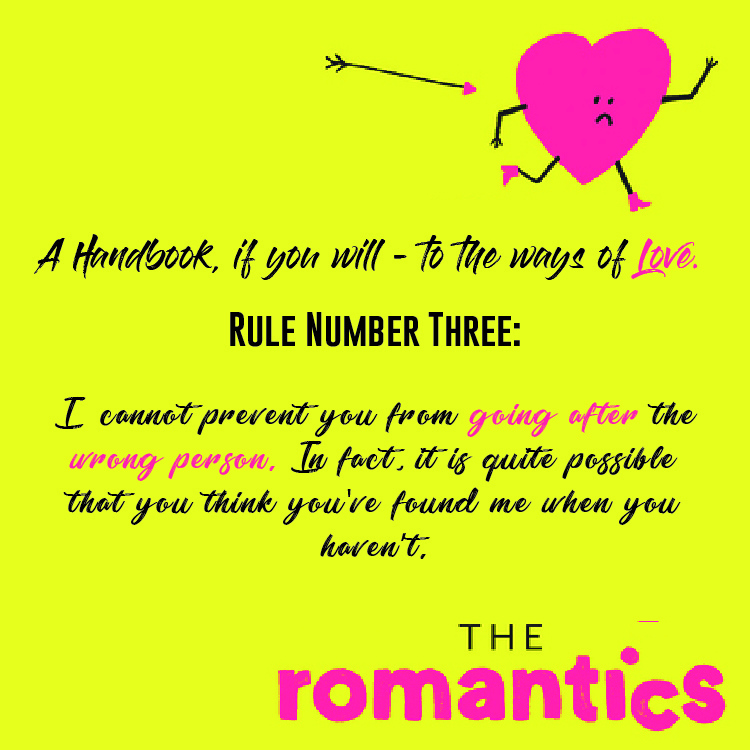 Just like your typical romantic comedy, this book is about a Grade A Romantic who gets cheated on his girlfriend and his best friend and is then on the search to find The One, and all this mishaps that happen along the way. The fact that Love was narrating this book made this SO MUCH MORE FUN because you constantly got to see the small things that Love did to set Gael on the right path including small signs, rain (because when do rom-coms NOT have a scene in the pouring rain) and even THE AIRPORT SCENE. One of my other favourite parts about this book was HOW MUCH it concentrated on family. As Gael’s got cheated on and dumped, his parents were also separating. There was a lot of anger and lashing out, but I LOVED THAT parental control and influence were such a big part of the story. More than ANYTHING, I loved Gael’s baby sister, Piper with her Scavenger hunt skills, French phrases and the optimism only an eight year old can have. I also loved Mason, Gael’s best friend despite what he did. He is one of the ONLY fictional best friends I’ve found it in me to forgive for cheating because this guy was ADORABLE in his own right and strangely loyal. 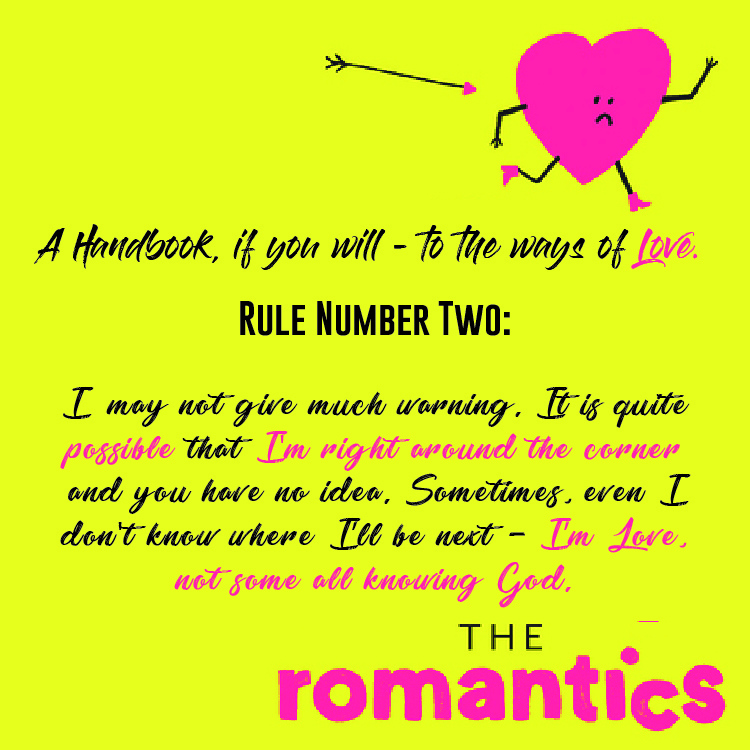 I loved Sammy Sutton, Cara and all the other characters in this book too but MOST OF ALL, I LOVED LOVE. The narration and mishaps were what brought this book to life and made it one I will definitely remember. One of the most hilarious and adorable love stories I’ve read in a while – told by Love itself! 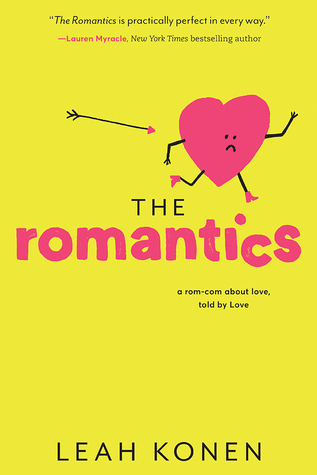 If you’re looking for a read that will have you laughing and rooting for everyone involved, PICK UP The Romantics. 4.5 stars. Leah Konen grew up in a two-stoplight farming town in Washington State before moving to suburban North Carolina, where there were many more stoplights and lots of sweet tea. After studying journalism at the University of North Carolina, she headed to New York City to pursue her dream of becoming a writer. 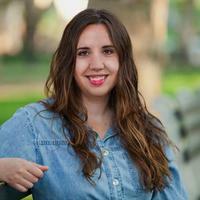 When she’s not working on novels and articles or writing for fashion brands, she enjoys devouring new books, spoiling her dog, Farley, biking around Brooklyn, checking out live music, and binge-watching TV. Find her online at www.leahkonen.com. What are some of the cutest contemporary novel that you've read? 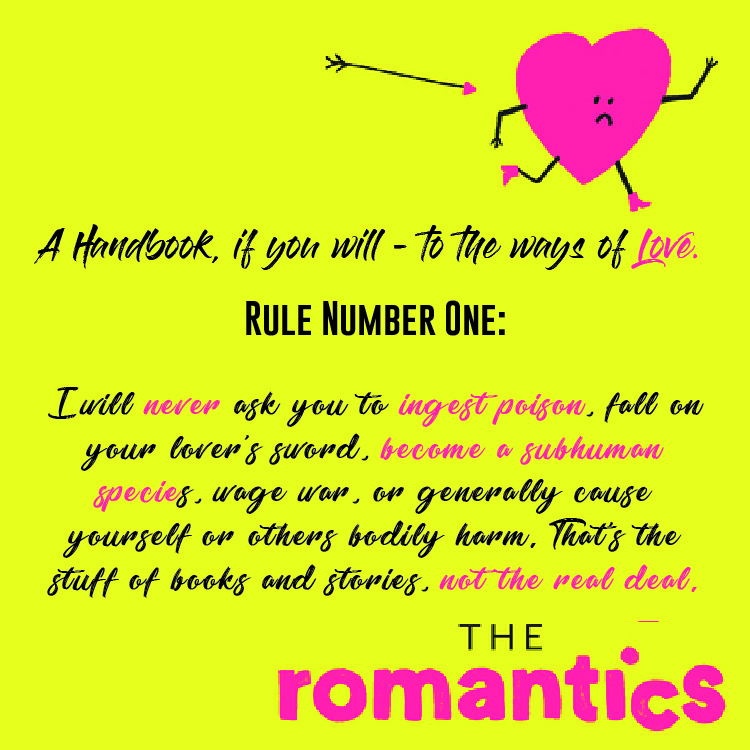 Have you had the chance to read The Romantics? What did you think of it? Have you read another book that is told from Love's perspective?